Original style as used on Williams games from 1977-1993 and Bally/Williams games from late 1980s through 1993. Original factory part # 5881-09021-00. 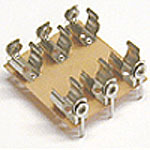 Solders directly to circuit board and holds 3 AA size batteries. Retain the originality of your classic Bally/Williams game with this authentic original part!